Hi! I have a couple of Labtec products to sell in one lot - a Labtec telephone computer headset amplifier with headset and a pair of Labtec multimedia speakers. I am asking $15 for both. A buyer looking for Labtec equipment and/or parts may be interested. The amplifier measures 5"L x 3.5"W x 2"H and I believe it is complete. The model number is LVA5700. It was never used but just stored away in a box of computer components. I have the paperwork that came with it including the user guide. Additionally, there is the headset with boom mic: I have the user manual for it as well. The pad on the earpiece and the stabilizer on the other side seem to be missing. It is designed with only one earpiece on the left only, model C-315. 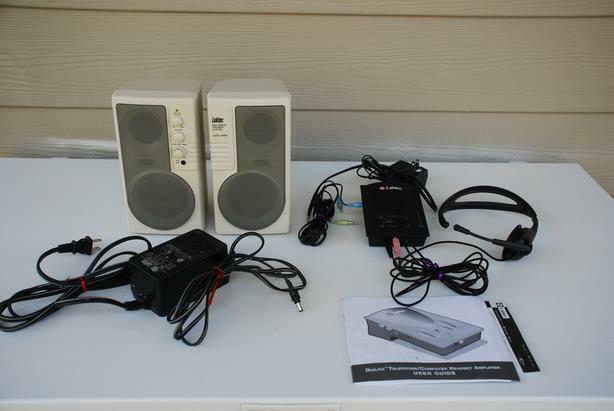 This wired computer speaker system has two grey speakers measuring 4.5"L x 5"W x 8.25"H and an AC power adapter. The model number is LCS-1400. I do not know if this system is complete. I am located in Vancouver, BC but shipping is no problem. I will be happy to mail these Labtec components to you using CanadaPost and Interac bank transfer. So, if you are interested in purchasing, e-mail me and we'll figure out the logistics and/or I can answer any questions you may have. Thanks!